Today I still have 96 cells! I think the way State of Charge SOC is shown on the app is confusing. SOC (display) is the one everyone is used to. It is the one shown on the car. This one is easy to understand. I think this should be the only one shown. The SOC (BMS) which you label 'actual', is not well understood. Many assume that it measures the SOC of the total pack, but it doesn't. My car has lost the 10% buffer at the top of the pack. The usable capacity is the same, the total capacity has shrunk, but when fully charged the ratio of SOC (BMS) / SOC (display) is the same as when the car was new. SOC (prec) is probably not an SOC reading but something related to it. I think this reading should go onto an extra page with debug values. Values that need to be tested to find out what they are. Please consider everything displayed by the SoulEVSpy app "debug values". Look at the values displayed in the car display, if those are the values you want to see . warren55 wrote: I am certainly not a programmer, but is there any chance we'll see future upgrades that would include things like a diagnostic screen where we could see fault codes, or turn the warning chimes off and on, like the Leaf Spy app? If this will work with the new Kia and Hyundai EV's coming out, I'm sure it would be hugely popular and I for one would not have a problem paying for it! I am focusing my efforts on the stuff that is not easy to accomplish in other ways. The fault codes you can read with one of the lite versions of Torque, so that is not my highest priority. pthack wrote: I have version 0.1.3-2912, and set it all to US measurements, but all the screens still show KM, or degrees C.
This is for the range screen, BMs screen, etc. pthack wrote: great info on tire pressure...but which sensor is which wheel? I don't think the car knows, at least I don't know how to obtain that information from the car. If you know, tell me, and I will code it. 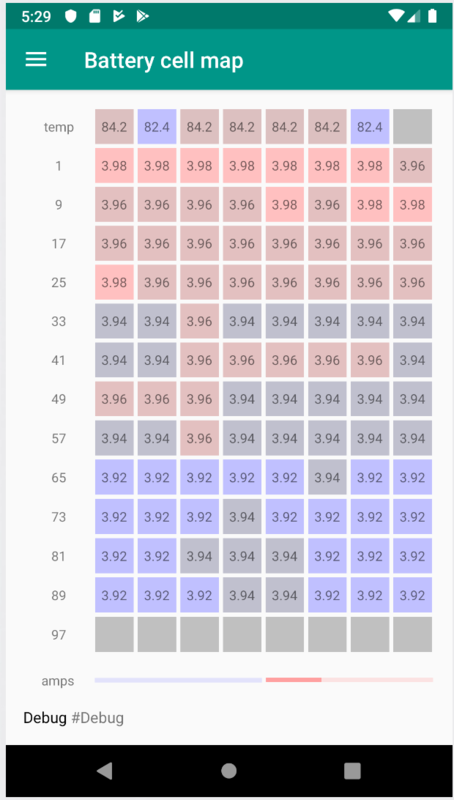 The selected units for temperature, distance and energy consumption now works in the app; you can see data displayed in US units (csv-file data are still metric units). I have added a main battery current indicator at the bottom of the battery cells page, indicating the level of current going in to the battery (blue) or out of the battery (red), -200 to 200 Ampere. 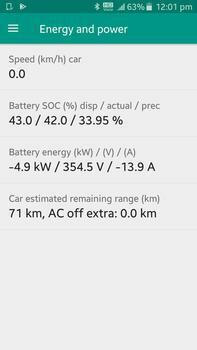 warren55 wrote: I just tried out the newest version, and everything works great, but I noticed something odd with my battery cell map. 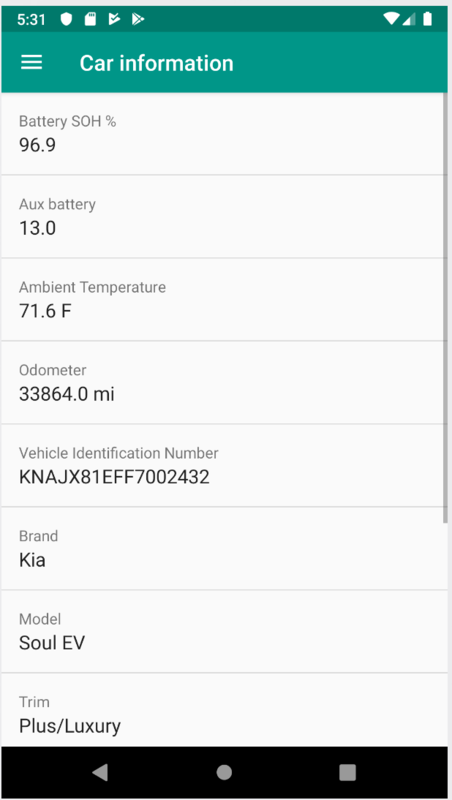 I have a 2016 which I bought used recently, and I am sure the battery pack has not been replaced with less than 10,000 miles on it, but it looks like I have 100 battery cells. Am I reading this wrong? Which version of the SoulEVSpy app were you using? What did you do prior to connecting to bluetooth - did you replay a csv file from another car at any time before this happened? I was using the current version at the time (v0.1.3-2999) and it was the first time I used it on my new phone, so I had not replayed any csv files that I'm aware of. The issue hasn't repeated itself since then. Yesterday I went for a long freeway drive and it reports 96 cells. I was a little concerned that during that drive my SOH seemed to drop from 107% to 103.7%. That seemed a little drastic to me. warren55 wrote: I was using the current version at the time (v0.1.3-2999) and it was the first time I used it on my new phone, so I had not replayed any csv files that I'm aware of. The issue hasn't repeated itself since then. If possible, could you please email me the soulspy.log2019XXXXXXXX.txt file from the time of the error (to kia@spjeldager.dk)? I would like to find and fix the root cause if possible, I dislike that the app can display erroneous data. warren55 wrote: Yesterday I went for a long freeway drive and it reports 96 cells. I was a little concerned that during that drive my SOH seemed to drop from 107% to 103.7%. That seemed a little drastic to me. 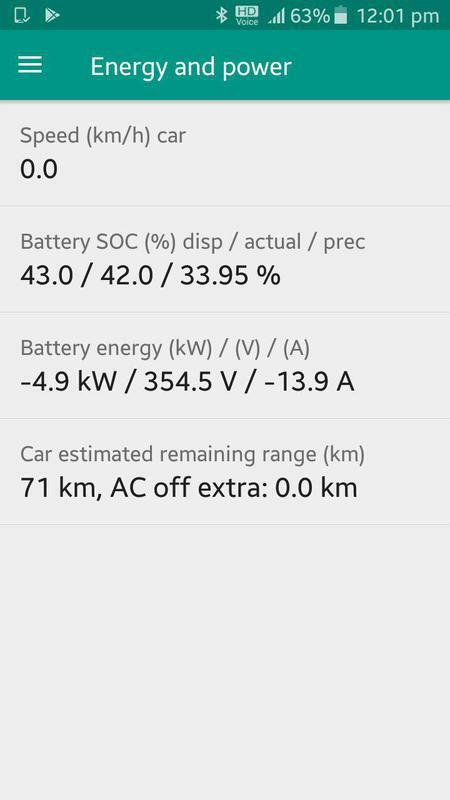 In my experience, the BMS only adjusts the SOH value when the car has been charged to near full capacity, and is driven to near empty ( < 20% SOC). Depending on how long ago this last happened, and what the battery experienced in the meantime (high temperature, high power driving, or extensive time at high SOC), the adjustment may be large or small. I bought my Soul EV from a dealer where it had been a demo car, probably standing idle charged to 100% SOC the majority of the time for 10 months, until I got it. It is now 4 years and 68000 km since first registration, and the SOH has been stable at 96,9% (max deterioration=13,9%) since july last year (odo 53000). In may the max deterioration was 10.0%. I believe the drop came due to multiple top speed driving stints with fast-charging in rapid sequence, on the German Autobahn during the summer heat.